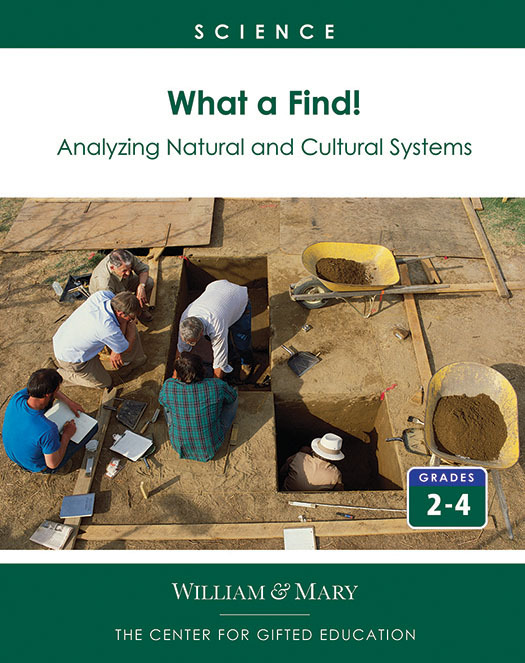 What an appropriate title for an exploration of the field of archaeology! In this award-winning unit for grades 2-4, students are put in the role of junior archeologists at a research museum and discover that construction work has been halted on a new school because historic artifacts were discovered. To determine whether or not the dig is important enough to halt building the school entirely, students learn to excavate and actually conduct the dig -- carefully seeded with "historic artifacts." The Center for Gifted Education (CFGE) is a research and development center providing services to educators, policy makers, graduate students, researchers, and parents in support of the needs of gifted and talented individuals. Located in Williamsburg, Virginia, the CFGE has established an international reputation for excellence in research, curriculum development, and service. Several major grants, including funding from the Jacob K. Javits Gifted and Talented Students Education Act, have provided significant support for the work of the Center. In 2012, the Jack Kent Cooke Foundation awarded CFGE the funds needed for a summer residential camp for low income, high-ability children, for four consecutive years. In 2015, William & Mary alumni, Mike and Nancy Petters, through the Petters Family Foundation, provided additional financial support to the program. In 2016, the Petters Family Foundation has committed to fully fund the program for the next four years. Camp Launch is only the beginning of the Center for Gifted Education’s goal to bring educational equality to all gifted students.